Run Time: Approx. 50 min. Big Idea Entertainment has been busy lately, producing three original DVDs this year alone. The latest offering celebrates the birth of Jesus and the themes of giving, forgiveness, and using one’s talents. 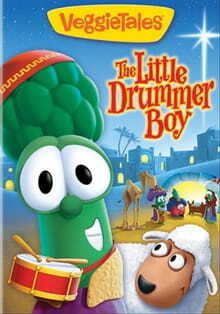 The Little Drummer Boy, Veggie-style, retells the classic story and its accompanying melody. Junior Asparagus starts off the story at home, where he drums on every available surface while waiting for friends who will go caroling with him. When his friends apparently “ditch” him, he goes into an unreasonable sulk, casting blame and insults on everyone. Grandpa Grape convinces him to listen to a story about a boy who also likes to drum. Aaron, the Little Drummer Boy (also played by Junior) is a lonely child who has lost all the people he loved. In his grief, he determines that he doesn’t need anyone—his sheep, donkey, and camel are all the friends he wants. They love his drumming so much that they dance for him. But people? Well, they can forget it. Trouble comes in the form of a dishonest group of entertainers . . . shysters, you might say. When they convince Aaron to join them, then take advantage of him, he is left at the mercy of the baby sleeping in a manger. Watch as his heart is softened by forgiveness and grace, and sing along with him as he serenades the Babe of Bethlehem. Guaranteed to touch the hearts of parents and children alike, this Veggie-version of the classic tale features silly moments sure to provoke giggles from the youngsters. They will also identify with Junior’s hurt feelings and unreasonable reactions. In doing so, let’s hope the littlest viewers also catch the lesson that Junior learned—that giving and forgiving are more important than having things go your way all the time. In fact, the entire show is based on Ephesians 4:32, which says, “Be kind and compassionate to one another, forgiving each other, just as in Christ God forgave you.” Featuring an extended scene at the manger—a staple of any child’s Christmas story—it also clearly communicates the gospel of Christ. The other sing-along song is an upbeat, cheerful ditty called “Can’t Smile Without Ewe.” Kids will also enjoy some of the extras featured on the DVD, such as visiting a drum factory with Junior, “The Little Drummer Boy” music video, and peeking “Behind the Music.” Parents are sure to delight in hearing GRAMMY and Dove Award-winning artists BeBe and CeCe Winans croon the title song. Parents should be aware that one scene may disturb young children. Little Aaron sees his home burned down by the Romans and believes his parents died in the fire.